Customer experience management. Three words standing for a whole discipline aiming at creating customer value through experiences which in turn leads to business value. Although customer experience management (CEM) contains the word “management”, individual customer experiences nor the end-to-end customer experience can’t really be managed in the strict sense. The customer experience belongs to the customer and is highly emotional, contextual and individual. What can be managed, however, is a process-based approach to design for valuable customer experiences, both individual and end-to-end. Other elements than can be “managed” include touchpoints, the brand value, the customer-oriented “culture“, the input and feedback from customers needed to optimize, response to customer intent, the design of the emotional dimensions of what it means to interact with your business, services, products and all experiences, regardless of the when, where and how. Understand the customer journey of the various customers in the ecosystem of your organization and act upon these insights to improve customer experience and customer satisfaction, using customer journey mapping. Monitor and analyze the perceived, measured and both directly identifiable and indirectly gaugeable customer experiences across the various touchpoints, individual interactions and overall brand/service/product experience from the customer perspective. Continuously design and optimize for better experiences and interactions based on multiple metrics, input sources and scores, combined with Voice of the Customer (VoC) programs and by involving the customer, also in the dynamic customer journey mapping process. Create organizational alignment and a customer first “culture” whereby, among others, staff education, employee engagement, the brand and striving towards common goals are important. Set up the nessecary processes and infrastructure (the “tools and process” part) in order to enable all of the above. The term customer experience management was defined in 2003 by Bernd H. Schmitt, as “the process of strategically managing a customer’s entire experience with a product or company” in his book “Customer Experience Management: A Revolutionary Approach to Connecting with Your Customers“. That definition has been gradually changed to also focus on interactions and even transactions with companies, products, brands or services. And this across the entire customer life cycle whereby there is an important role for what happens before and after the strict buying journey. Regardless of definitions, the value of customer experience management and the virtue of its practitioners mainly revolve around customer- and employee-oriented elements that have become more important than ever, making customer experience management – or at least the principles – become adapted in numerous other domains. Given the crucial role of the customer experience for business, the attention for customer experience management continues to grow but, along with it, so does confusion. The customer-first approach. CEM looks at customers as people of flesh and blood. This is in contrast with the tradition of labeling customers and people as, for instance, email subscribers, consumers, names on a list, etc. as we’ve been doing for a very long time in traditional views and monologue approaches. The importance of emotions and the subconscious. Along with the more “human” and holistic view on customers as people instead of as “fragments” we need to “target”, the emotional dimension has a crucial role in customer experience management. Although the emotional needs, experiences, triggers etc. of customers have been used in other domains as well (marketing optimization, branding,…) it is dominant in a customer experience management context. Furthermore, there is a close link between customer experience management, optimization and brand values. People-to-people. Just as customer experience management stress the importance of the rich and deep personal and emotional aspect of the customer journey and customer interactions, it stresses the importance of these dimensions in the context of the organization and its employees. Trust, empathy and people-to-people as well as brand experiences (brands are about people too) are crucial elements here. Although we often differ between B2B and B2C, in the end all is people-to-people. Nevertheless we continue to differ between B2B and B2C or maybe we should say between more complex customer journeys with several decision makers and go-to-market channels on one hand and more direct journeys on the other. Still, it’s a people’s business, also in each key decision maker journey and experience. The role of brand and employee. Customer experience management looks at brand values and attributes as drivers of decision about how to treat customers and looks at the role of employee engagement as a key differentiator. This is explained well in the four customer experience core competencies of Temkin Group. A holistic view. As briefly mentioned earlier and as also visible in the four customer experience core competencies approach of Temkin Group, customer experience management is about a holistic view instead of just customer-oriented optimization in some areas. Leadership, customer connectedness, the focus on listening to the customer and acting upon these insights, on top of employee engagement and he brand value perspective all point in that direction. That’s also why the end-to-end customer experience matters a lot and not just individual experiences across specific touchpoints (even if both matter). Taking the customer and customer experience optimization deep into the entire organization as a driver for mutual and connected value, business transformation and a customer-centric and even people-centric approach in the end is what makes customer experience management so important in rapidly changing market and customer realities. While it might seem obvious that the customer takes center stage, the silos, disjointed processes and lack of “customer-oriented alignment” (let alone “culture”) is still a main challenge for most organizations. The practice and approach of customer experience management has influenced many areas of business, marketing and service. There is also an increasing attention for the so-called “digital customer experience”, just as the customer experience is key and even driver in many digital transformation projects. Change is indeed a key term in the whole customer experience equation across the organization. 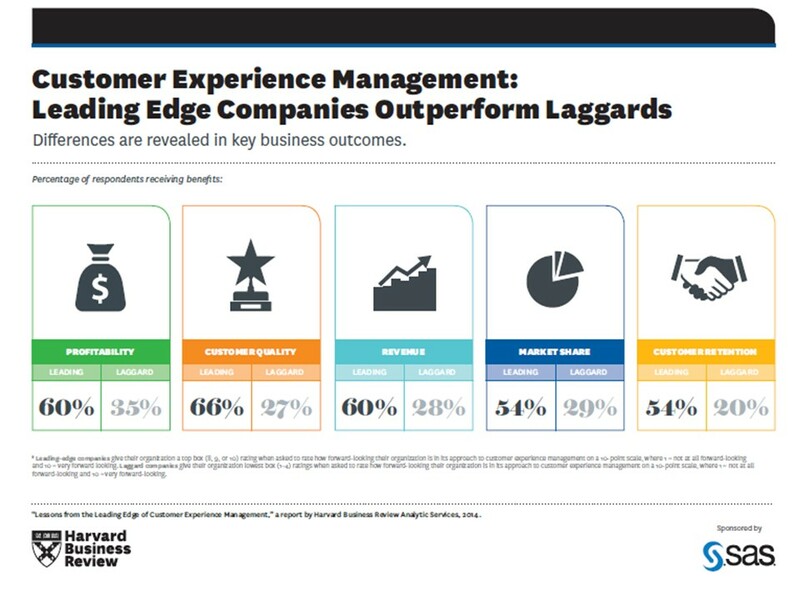 Customer experience management continues to influence business, among others in regard to the importance of consistency, training and enablement of staff (not just in traditional areas such as customer service or contact centers where training remains a challenge but also across the enterprise), personalization and analyzing customer behavior, emotions, feedback and data (and acting upon them). If we look at customer experience management “as the design and reaction to customer interactions to meet or exceed customer expectations and, thus, increase customer satisfaction, loyalty and advocacy”, as Gartner describes it, it’s pretty clear you can only react and design in a limited way. Given the emotional nature of the perceptions of your customers and the richness of what constitutes them (don’t overlook the subsconscious) and given the fact that there are so many indirect interactions shaping the customer experience (and often not voiced), it’s important to look at what you can do and not just see customer experience management as the analysis of what customers want and how to act upon these insights. Although it’s important to have a broader approach, priorititization, depending on the clearest customer experience gaps and leaks de facto comes into play here. What matters at least as much, however, is a holistic and ubiquitous optimization mindset and processes that is deeply integrated across the organization.